"I do what I do. There are too many personalities that I have to deal with. Everybody don't like Cap'n Crunch, some people like Chex Mix, I get that. I'm not upset with anyone. But I'm gonna tell my story, how I do it." You know, the season may be over, but that's no reason to sing the summertime blues at The Paramount. Come to think of it, there's nothing blue about summers in Austin at all. Temperatures climb, and some people have been known to get crazy from the heat (It helps keep Austin weird, after all). Like an oasis in the desert, The Paramount Theatre is a perfect way to escape those sky-high temps. However, an upcoming show may only offer a respite from the heat while keeping the crazy. Why, you ask? Because we got a whole new brand of insanity coming to the stage, and his name is Tracy Morgan. Yes, that Tracy Morgan. You know the guy: successful yet polarizing comedian, film star, voice actor, wild card, joker. Emmy-nominated for his role as Tracy Jordan in the critically-acclaimed "30 Rock," Morgan is loud and outrageous, but also crazier than a bag full of cats. Get ready, Austin. We're taking weird up a notch, and there's no telling what could come out of this guy's mouth. Chances are, it'll be cray cray. A staple of the stand-up circuit for years, Morgan grew up in Brooklyn and performed his comedy in his way. 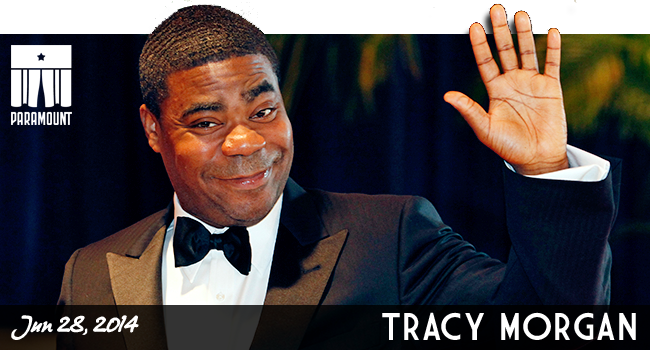 After some small but memorable parts in movies and TV shows, Tracy hit the big time when he landed a gig as a regular Saturday Night Live cast member. While his comedy proved to be an "acquired taste," it wasn't long before Tracy began to bark his way into American pop culture. In 2006, Tina Fey launched a pet project of hers, a prime-time comedy, and brought Tracy Morgan with her. On "30 Rock," he then took his game to a whole new level. Morgan was hilarious as Tracy Jordan, a loose cannon comedian who is called upon to anchor a show but keeps everyone on edge because of his loud and unpredictable tendencies (sound familiar?). At first, I always felt that Morgan was playing a caricature of Martin Lawrence (the meltdown running-in-the-street Martin Lawrence, mind you) and that made for an interesting character during the first season. Yet as seasons went on I realized that Morgan was actually playing an exaggerated version of himself. It's not easy to stand out on a show that showcased the talents of so many, but Tracy set himself apart in a boisterous way only he could pull off. Alas, Morgan is no one-trick pony. He's parlayed his success into other ventures. Morgan wrote an autobiography a few years ago and has provided voice work for the Rio animated movies. Tracy also co-starred in Cop Out, an action/comedy also featuring Bruce Willis. A throwback of sorts to old buddy action movies like 48 Hours, Morgan played the "Eddie Murphy role" (if, you know, Murphy was louder, sweatier and even more raw and delirious). Soon Tracy will be bringing his game back to TV screens in a FXX comedy produced but the "It's Always Sunny in Philadelphia" gang. If his work on NBC pushed the envelope of restraint, then his appearance on a network like FXX will likely put that envelope directly into the paper shredder. Not that Tracy Morgan is all play and no work. He's worked to offend and isolate many throughout the years, often by "going too far" in expressing candid opinions in interviews. While surely his remarks are simply meant to play for laughs, he's certainly ruffled some feathers. It's sometimes kind of amazing that he hasn't burned bridges left and right through his career. Tracy, it seems, was born without the filter that most of us have in place before we speak our mind. You know how you see something that irks you and for a split second you wanna rant or otherwise verbally throttle them? Then, after that momentary flare, you realize that you a sane and respectable member of society and dial your reaction back to an eye roll or exasperated exhale. That's completely normal. And yeah, um... that's not Tracy. When he speaks, you're most likely to laugh, but every now and then you're just as likely to gasp and briefly recoil. Maybe you're even laugh in spite of yourself. And truth be told, that's part of Morgan's appeal. It's simple, and yet it's more than Morgan just "keeping it real." At time of our lives he all have had that friend that is exactly like Tracy Morgan. You remember the guy. He was in college, or a former co-worker, or an in-law. Heck, they may be your relative right now. They speak their mind, you cringe, then giggle or guffaw because you can't believe what you just friggin' heard. And even though you were sometimes shocked, you still liked the guy because he was funny. Because he was crazy. Tracy Morgan is coming y'all. Come on Saturday, June 28th at 8:00 p.m. and see him turn it funny. Come for the initial laughs and then stay... for the cray. It was the best of times, and... Always an annual celebration of storytelling, artistic expression and culture, The Paramount and State Theatres once again again ready themselves for the upcoming season. This year, however, it will be a tale of two seasons. A fall/winter and then a winter/spring. Two halves, but each still packed with all the amazing performances we've grown accustomed to over the years. As always, you can come to them individually, or you can subscribe for the best selections. Branford Marsalis follows up last year's successful show with an appearance this year at The Long Center. And this year, he needs the larger stage because his aims are more ambitious. Branford blends the musical worlds of the sacred and the secular with Abyssinian. This gospel celebration features Marsalis' Jazz at Lincoln Center Orchestra and adds a 70-voice gospel choir, Chorale Le Chateau, all conducted by Damien Sneed. The Long Center will overfloweth with joy on Tuesday, October 15, 2013 at 8pm. ACS is a trio featuring three of the most significant female artists in contemporary jazz. Featuring Geri Allen on piano, Terri Lyne Carrington on drums and Esperanza Spalding on bass. Last year Esperanza set hearts afire with her solo show, and this year these ladies are sure to push boundaries with their acoustic creations and dazzle us like no other possibly could. Come listen to their sound reverberate throughout the Paramount's cozy confines on Thursday, October 17, 2013 at 8pm. For the past few decades, these guys have remained one of rock's most engaging storytellers. As faces have changed and music cultures have evolved, these legends keep going like a long train runnin'. They're taking from the streets (if you will) and to The Paramount stage on Tuesday, November 5, 2013 at 8pm. Mary Chapin Carpenter & Shawn Colvin collaborate for an evening of musical enjoyment. Together, they revisit songs from their respective catalogues and also cover some of their personal favorites. These two singer/songwriters bbring their charm and amazing voices for a special evening at The Paramount on Wednesday, November 6, 2013 at 8pm. As if Election Day isn't entertaining enough, here are a few more reasons to smile in early November. The Daily Show Live brings a unique multimedia presentation to the theatre. Featuring the talents of Comedy Central's own The Daily Show correspondents Al Madrigal and John Hodgman and executive producer/writer, Rory Albanese, this trio will give peek behind-the-scenes about the program. Showcasing their skill as natural comedians, this Q&amp;A will be presented by some of the men behind the funniest newscast on television today. Or rather, I should say intentionally funny, because I get the impression that FOX News is actually serious in is presentation. Come laugh on Friday, November 8, 2013 at 8pm. Sarah Vowell is, in many way, a modern historian who helps provides a context to our culture. She is New York Times' bestselling author of six nonfiction books on American history. Sarah offers personal and humorous accounts and musings about the tapestry of the great American quilt of our culture. Also a contributor to This American Life and The Daily Show, she now brings her wit and wisdom to us on Wednesday, November 20, 2013 @ 8pm. The best in Improvised Comedy: That's really all you need to know. This tour cast is hand-picked from the best improv comedians in New York City and Los Angeles, and they're coming here for... well, who knows what. It'll be funny and likely to bust your gut. Be prepared to laugh and be ready for anything. Wednesday, November 20th, 2013 through Saturday, November 23rd, 2013 at various times. Now what the heck could I possibly say to do Bob Newhart justice? The master of deadpan humor, he is a comedic genius who has appeared on television, film and is a best-selling standup comic recording artist. Bob Newhart's career is the very model of generating laughs for decades, and he continues to sell out venues all over the nation. Get into this show before it also sells out. Newhart appears at The Paramount on Friday, December 6, 2013 at 8pm. Every year we get drawn back like a moth to a flame. It's storytelling. Pure and simple. Engaging, enlightening, and moving like no other, The Moth is back for another set of narratives to grab our attention. This raconteur delight happens again on Wednesday, December 11, 2013 at 8pm. Alas, America's spirit of space exploration is on fumes. Weep not for the future, though. If the renown Dr. Neil deGrasse Tyson has anything to do with it, we will continue to explore the meaning of the cosmos for decades to come and keep reaching for the stars. Neil is an academic beast, earning eighteen honorary doctorates and the NASA Distinguished Public Service Medal, the highest award given by NASA to a non-government citizen. A fixture in scientific circles for his own-to-earth persona, he breaks astrophysics for the mass consumption with his signature humor. Live, listen and learn could well be his credo. One thing is certain, he is riveting to infinity and beyond. Come have a listen with Tyson at The Paramount on Tuesday, December 17, 2013 at 8pm. American songwriter and pianist Jim Brickman hosts a holiday celebration warmer than your yule log. Join Brickman and his special guest performers presents a blend of music, entertainment and joy. Put down your egg nog, grab your loved ones, and come down to The Paramount on Thursday, December 19, 2013 at 8pm. An entertainer in every sense of the word, Ann Hampton Callaway is an accomplished singer, pianist, composer, lyricist, arranger, actress, educator and producer. At home in concert halls and jazz cabarets, she can reinterpret classics in fresh new ways. Inside The Stateside at The Paramount, Callaway will celebrate Barbara Streisand's career. From Barbara's Broadway show tunes to her film works, to pop favorites and more, Callaway will perform Streisand like only she can on Thursday, January 16, 2014 at 7pm and 9:30 pm. Ray Price possesses one of the most signature baritone in country music, and has been crooning hits since the early 1950s. Now in his eighties, Price still is going strong and hits the road for a number of shows every year. This year, The Paramount hosts on of these special stops for this long-time staple of country music. Join us on Wednesday, January 22, 2014 at 8pm. A former United States Poet Laureate, Billy Collins is an American icon. Critically acclaimed and popular in appeal, he has become the most accomplished poet in the U.S. since Robert Frost. Currently the Poetry Consultant for Smithsonian Magazine, his public readings are always an event to remember. Come share in a new memory at The Paramount on Thursday, January 23, 2014 at 8pm. It's going to be the best of times, and ... well... Yeah it's just pretty great. No bad times to be found here. Don't miss a single show, or else it may well be the worst of times, indeed. What are you waiting for? Get your tickets now! I'll see you there. "Film preservation should be of interest to everyone- from the average film fan to the most erudite scholar. We cannot allow such a significant part of our history to vanish." It's been another great season at the Paramount, with performers, authors, raconteurs, singers, actors and comedians all bringing their immense talents to the audiences of Austin. It seems like just yesterday that things kicked off with provocative film director Spike Lee, and now the season comes full circle with the affable film critic and historian Leonard Maltin. A staple of the American film critic society, Maltin will conclude the series. With the annual Paramount Summer Classic Film Series imminent, it's only appropriate the one of the most vocal advocates for film preservation be the guest for the evening. For over 30 years, Leonard has been the film reviewer for television's "Entertainment Tonight," becoming one of the most visible film critics working today. While critics had previously been confined to print in the past, Maltin (along with Roger Ebert, Gene Siskel and Gene Shalit) was at the forefront of film critics who became household names by establishing themselves on TV. While some of his contemporaries could be acerbic or snarky in their reviews, Maltin always projected a warmth and friendliness that set him apart. In fact, he often comes across as just about the nicest film critic who ever reviewed movies. But Maltin's efforts aren't just limited to film critique. He has been a tireless champion for film preservation and restoration. Repeatedly over the years, Leonard has considered himself blessed to have seen so many vintage films during his youth. Alas, the fragile medium of film means that great care must be taken to ensure that future generations get to experience the same stories that were told decades ago. Time and money must be invested into saving film of yesteryear, or we could lose early cinematic works just by doing nothing. Idle hands mean we lose more films as they dissolve into dust. Leonard Maltin will bring with him a rescued film from an American master. Frank Capra is best known for directing IT'S A WONDERFUL LIFE, MR SMITH GOES TO WASHINGTON and IT HAPPENED ONE NIGHT, but there was an early gem of his that was all but lost for six decades. After its recent recovery and restoration, The Paramount will host a screening of this classic: LADY FOR A DAY. It's remarkable to think that a film like this was deliberately hidden away. But you know what? It's just best to let Leonard explain it himself. After the film, Maltin will be available for a discussion about the film and his thoughts on other endangered works or art. It's a film lover's treat and a preamble to the summer series. Ok, well, maybe not a monster. But certainly a Gremlin. Leonard Maltin is a modern torchbearer, keeping the flame of classic cinema going for generations to come. In an era of disposable entertainment, let's all try and remember that there are better ways to introduce future generations to film than with Transformers movies. Come and behold a recovered Capra jewel, and be grateful that we haven't lost this treasure like dust in the wind. That would be the reel tragedy. "I've been keeping a diary for thirty-three years and write in it every morning. Most of it's just whining, but every so often there'll be something I can use later: a joke, a description, a quote. It's an invaluable aid when it comes to winning arguments. 'That's not what you said on February 3, 1996,' I'll say to someone." I awoke a couple of days ago and felt an insufferable case of the Mondays; that malaise one feels at the end of March. Deep inside you know it's technically spring, and it's supposed to be infused with the feeling of rebirth and renewal and other marketing buzzwords from places like Bath & Body Works. To be honest, I wasn't sure why I was blue. Perhaps I was merely run-down. I had, after all, just returned from an amazing Spring Break trip, and trying to get back into the routine of a working life after a prolonged absence is always difficult to readjust to. It's like when you're on a people mover at an airport, and you step off of the conveyer belt back onto stationary ground. Your momentum shifts to a halt, and no matter how hard you try to maintain a graceful stride you always step off and land with the grace of a newborn fawn. So this lingering sense of jet lag from international travel combined with fluctuating Texas weather had finally culminated into a generally foggy state of mind. I was playing ridiculously bad pop music in my head in the shower that morning, when a thought flashed through like a bolt of lightning amidst my brain's cumulonimbus clouds. Is it...? Is it April already? I blinked and placed the bottle of aromatherapy shampoo in the shower caddy. It... it is April! And like that, it was as if a sunbeam bore through the clouds. My focus shifted and, like a allergy medicine commercial, the veil lifted and life's viewfinder was suddenly crystalline clear. What does April historically mean to me? Well, among other things, the month brings April showers, schizophrenic weather patterns, clearance Easter candy at the local market, a run on allergy meds, and most importantly... Big laughs here in Austin. In what has become a bit of a annual rite, The Paramount welcomes David Sedaris back to the Long Center for what is sure to be another evening of anecdotes, diary entries, book recommendations, tears and exhausted facial muscles. In what has become itself a rite of spring, the arrival of David Sedaris to town is more welcome than any weather-forecasting groundhog, velvet-clad leprechaun or chocolate-peddling bunny. When David is in Austin, it's always a treat. Sure, it's a peek into the mind of the single funniest man you will ever listen to, but it's also just so damn hilarious. He may not put the "fun" into "funny," but he certainly highlights it with his sardonic wit and clever cultural observations. For those that don't already know, Sedaris is an author, playwright and a regular commentator on National Public Radio. I love how his descriptions are incredibly vivid. He uses words to paint scenarios and characters in your head as effortlessly as Bob Ross made happy little trees with a sponge and a dab of chartrueuse paint. 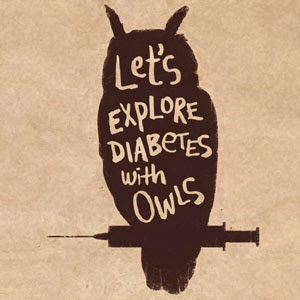 In fact, this years visit has a greater significance because the day before he speaks, his latest book will be released in stores, Let's Explore Diabetes with Owls. Needless to say, many of us are eagerly waiting this new collection. Maybe not like those Muggles- er, I mean crazies that camped out for Harry Potter, but certainly with great enthusiasm. And yet, no matter how many times you've read his works, there is nothing quite like hearing telling you a story orally. There's a whole new level of vibrancy when you hear David tell a story or read a journal entry. His soothing yet nasally voice make the contrast between the nondescript details of his observations and the shocking aspects elevate a simple tale into high art. Imagine your high school Geometry teacher stopped his normal drone about acute angled. Then, without changing the inflection of his voice, continue into a calm rant about the obtuse behavior of a boorish and crass society. David's dry wit and delivery go down smoothly like a glass of red wine with top notes of sarcasm. Not merely an advocate for his own observations, a bonus treat at his shows is when he personally recommends something he is currently reading. Last year, he raved about the darkly funny Deadly Kingdom: The Book of Dangerous Animals by Gordon Grice, a collection of anecdotes and facts about some of nature's thugs, capable of wrecking havoc on humans. A quick read through this and you may proclaim, "The heck with the gun control debate, keep that marsupial away from me!" In years past, David also takes questions from the audience and will stay afterwards to sign books for all who attend. It would be an ideal time to ask followup questions about his new book, although he may not be willing to explore the glucose levels of Hedwig. You're better off asking a Harry Potter fan about that one. So with the fog lifted and my scalp smelling minty fresh, I stepped out of the shower and circled the date on the calendar to mark the annual visit of David Sedaris. Until then, I'll continue to wash my hair every morning with some of that Eucalyptus Spearmint shampoo. That aromatherapy always makes me feel better, according to Bath & Body Works. And while I'm not inclined to believe the marketing, I will heed last year's warnings about deadly animals. I now pray that a wild koala won't attack me because I lathered, rinsed and then repeated. David Sedaris visits The Long Center as part of the season series on Wednesday, April 24 at 8:00 p.m. I'm someone who loves the cinema and the arts. I also appreciate the absurdity of American pop culture and the power of storytelling. I write this blog as a publicist for The Paramount Theatre, a majestic and historical landmark in the heart of Austin, TX.